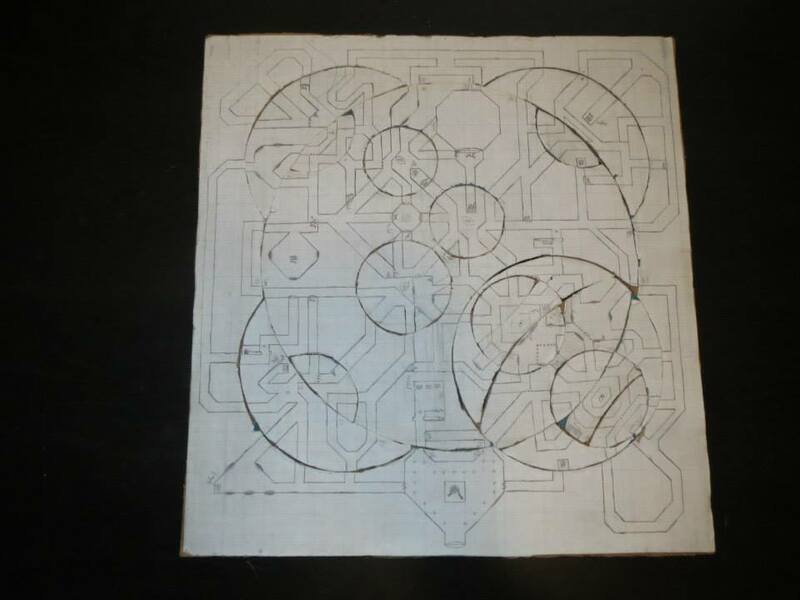 Given great interest in the Rotating Labyrinth (click for a brief overview), and particularly people wanting to build their own to run, I am including here a description of how I would build one out of cardboard if I were to do it again. I am working (when I get the time) to design a 3D printable prototype which might pave the way for a mass production Kickstarter. For now, I want the resources to be available for those who want to make their own and run it. 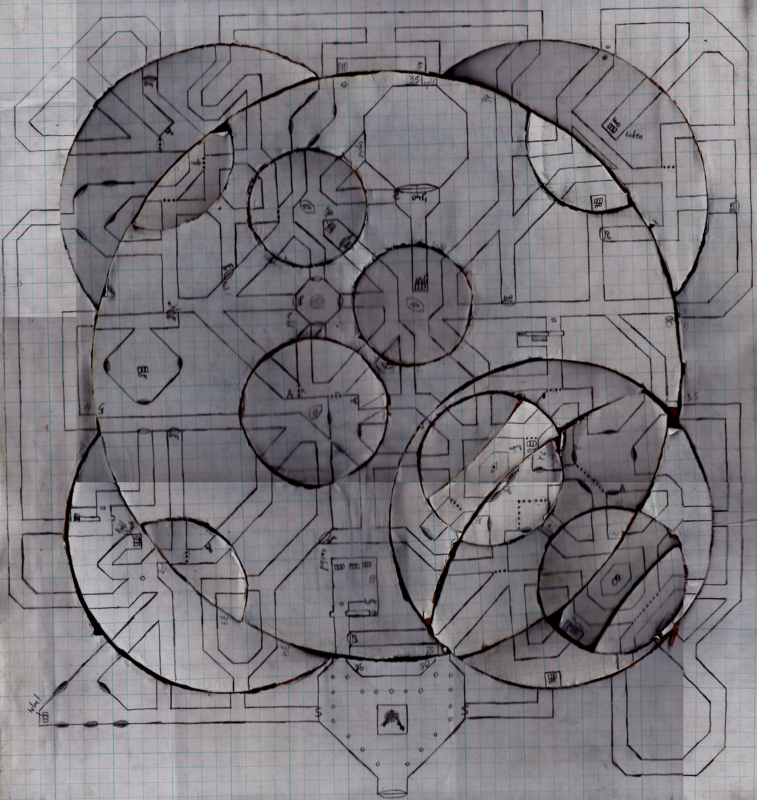 This PDF contains instructions for how I run the dungeon: RotatingLabyrinthInstructions. (See the new source in the update above). I run it with my Mind Weave rules, but I have also included the necessary conversions to run it in D&D 3.5. 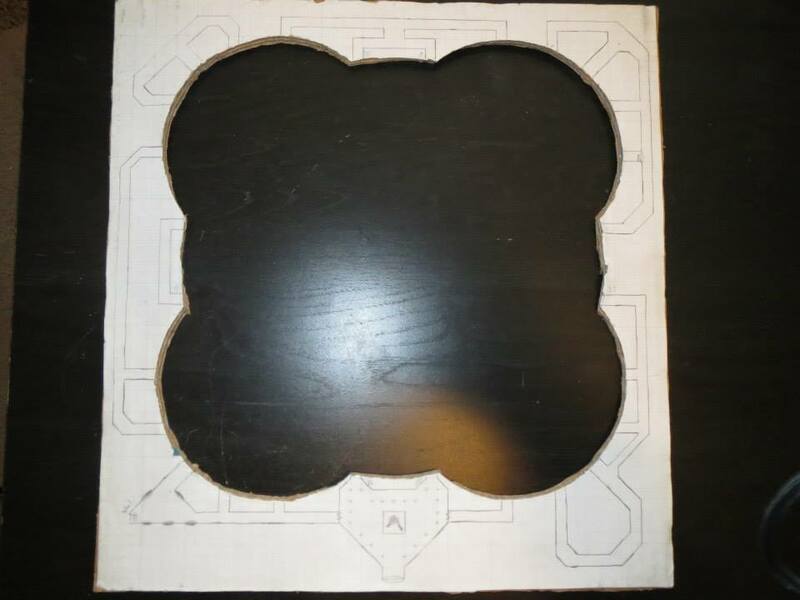 Draw out or print out the map and glue it to a piece of cardboard (preferably the kind for refrigerator boxes and stuff, not cereal boxes). 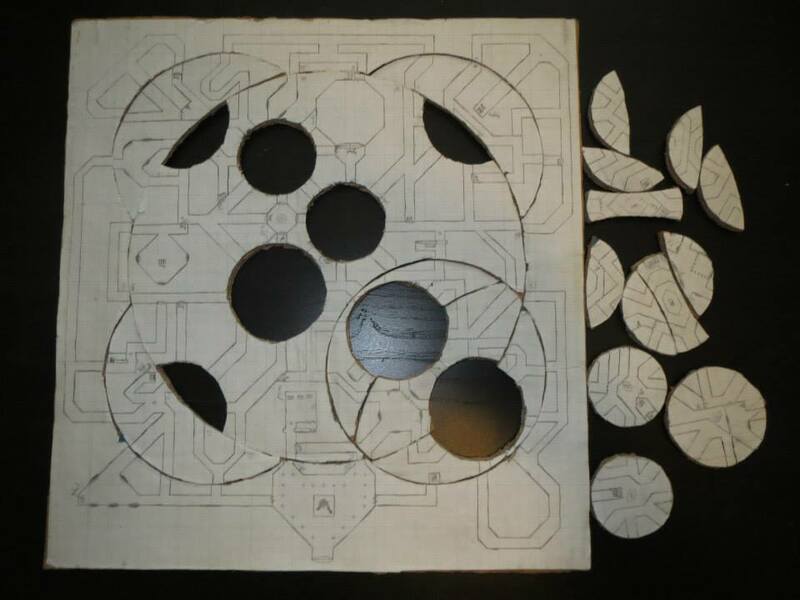 Cut out all of the small circles and their shards, as shown below. I used a steak knife, but it can be hard to rotate the pieces if you don’t cut carefully. Glue the swiss cheese-like chunk to another piece of cardboard. 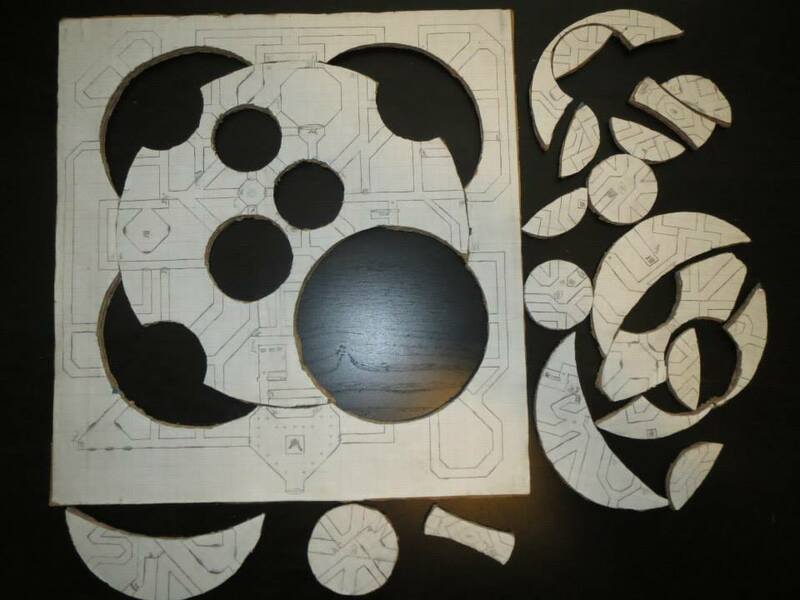 Cut out the second largest circles and its shards as shown below. Glue the now even more holey piece of cardboard to another one. 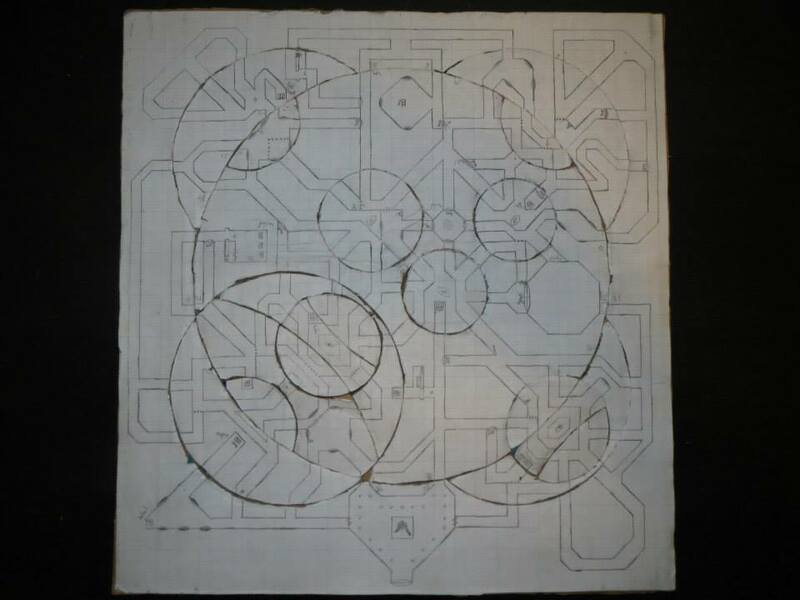 Cut out the large circle, leaving only a border and the unmoving maze sections. Optionally, glue this to another piece of cardboard. Replace the pieces. Since the maze rearranges, the pieces can go anywhere for the most part. The whole circles should not cross any other circle lines. Be careful where to put the two smallest circles. Play around with it to get a starting condition you like. Please comment below if you have any advice for improving the dungeon or the crafting process. If you have any questions or troubles, I am happy to help. Just ask! Great respect for this cool fretwork! i play the 3d version of the maze and dident change why? Stuart never implemented the doors or the changing, so the 3D maze isn’t quite the full experience. To my knowledge, he got bored with a random project picked up from the internet and moved on to bigger and better things. Any Ideas on how to run this in 5e? Also, how do you present a (player) map for this (or don’t you?). I imagine that 5e has most of the same tools available as 3.5, which I wrote a full module for here: http://www.drivethrurpg.com/product/209116/Rotating-Labyrinth. It’s not a combat-centric dungeon, so exact balance isn’t vital. As far as maps for the player, I have them do their own mapping as much as possible, sometimes presenting the map covered with papers except for what they can see. I find that few players make much headway troubleshooting the maze on their own and will give the most worthy character a vision of the map if they are forced to make camp inside. If you’re willing to let it span multiple sessions, tracking time, rations, water, torches, etc could make it a grittier experience. Next time I run it, I intend to make starvation a real possibility, but that’s only because I have a party that I think can appreciate the drama of drinking out of puddles in a diabolical maze.